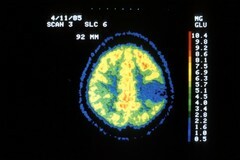 A PET scan (positron emission tomography) of a 17 year old girl with a longstanding history of epilepsy, who has a brain tumor classified as a grade 1 astrocytoma. The PET scan indicates that the tumor is not metabolizing excess glucose and is therefore benign. PET scans allow doctors to tell if a tumor is malignant without resorting to a surgical biopsy.